Brief Synopsis – After Winston Churchill becomes Prime Minister, he must deal with the politics of the government at the same time that he must spearhead a war against tyranny along with his two allies, The US and The Soviet Union. My Take on it – This is a film that shows us the kind of man Winston Churchill was especially once he became Prime Minister at the beginning of World War II. He made himself the kind of man (and leader) that he needed to be when the situation required it of him in order to face the tyrannical Nazi onslaught of Europe. 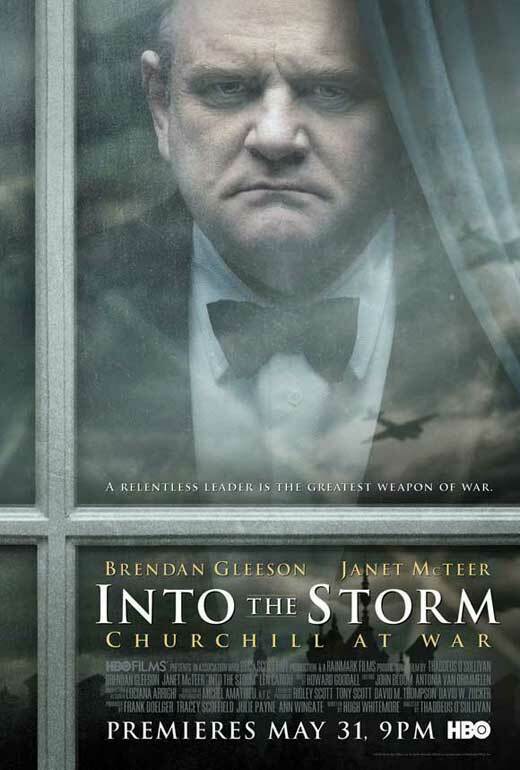 Brenden Gleeson is superbly cast in the role of Churchill and while other actors have portrayed the character slightly better, he still gives a powerful performance that garnered him an Emmy win as Best Actor. We are shown what kind of life he is forced to lead during the years of the war and did all he could to defend his country in such a patriotic way. We get to see how this mantle of leadership cost him dearly both personally and professionally yet he still marched on despite this. This film does a great job showing how Churchill started a strong friendship with US President Franklin Roosevelt and how the two of them together were always slightly suspicious of their agreements with Soviet leader Joseph Stalin which would eventually lead to the Cold War once World War II ended. Bottom Line – Great biopic that shows what kind of man Churchill needed to be in order to find a way to try and stop the onslaught of the Nazis in Europe. Gleeson is superb in the title role and although there have been some better portrayals of the British Prime Minister, he still does a great job with this role and even won an Emmy for his portrayal here. We get to see what kind of life he was forced to lead during wartime even if it cost him so much in both his personal and professional life. They do a great job showing how his friendship with Roosevelt and both of their suspicions of Stalin led to what became known as the Cold War following the end of World War II. Recommended!